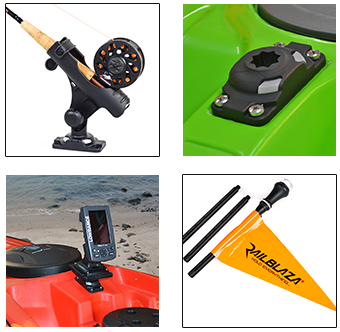 With versatile, easy-to-install mounting systems and accessories, RAILBLAZA offers durable — and affordable — ways to customize customers’ kayak experience. RAILBLAZA has been committed to producing the mounting systems and accessories designed to make kayakers’ lives easier since 2010. Whether it’s a camera to document outdoor adventures, a rod to take in the day’s big catch or cup holders to keep cold ones close at hand, they know that proper mounting is key.The product that sets RAILBLAZA apart from the competition is the innovative StarPort mount. The StarPort is a multi-functional mounting bracket that allows users to fit and swap out a full range of RAILBLAZA products to their kayaks. Because of its versatility, you’ll struggle to find a way you can’t use the StarPort. Interested in carrying RAILBLAZA products? Contact Us.